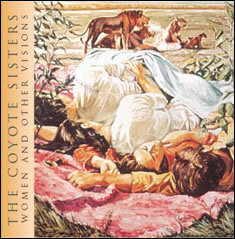 You can purchase our most recent CD release "Women and Other Visions," a selection of songs written and performed by The Coyote Sisters! "The Coyote Sisters' harmony is mesmerizing, their songs original and diverse, and, best of all, their words actually mean something. Women and Other Visions is a haunting album, fresh and yet oddly familiar, ethereal and yet totally accessible." Rotate knobs to adjust sound!